If you are looking for a cutter or trimmer to help you trim boards, mats, or mounted output, you've come to the right place. 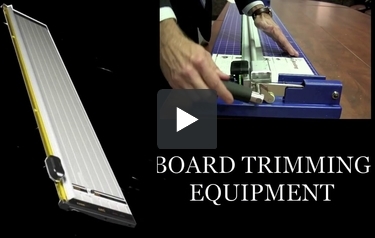 We carry a number of different laminating board trimmers and cutters to fit your needs. Whether you are looking for a large scale, high-production board trimmer or a smaller scale trimmer, we have the products you need. We carry all types of professional laminating board cutters and trimming equipment from awesome manufacturers such as Foster Keencut and Fletcher Terry. Check out our selection below and save today with MyBinding.com. One of three interchangeable quick-change drill tips included. Choose 3/4", 1/2" and 0.28" (7mm, 12.7mm, 19mm diameters. Works with 3/16"(5mm) foam board. Feature quick change blades and ergonomic designs. Welcome to MyBinding video. Board trimming equipment is extremely important in your line of work and we have what you need. A simple scroll down this page and you’ll see just how many selections we have, from small to large, from table top to entire stations. With trimming boards and oversized laminated items, you need length and flexibility, yet you need a machine that works just like a standard paper trimmer but can work through corrugated cardboard and other materials. Our dedicated staff is knowledgeable and will help you find exactly what you need and all the supplies you need with it. Since customization is a specialty of ours, we know what specific needs you really have. We’re here for you at the phones or just a chat away. All items come with a description, review and, often time, a video to see it in action before you buy. When image matters, MyBinding.